Click the FREE button above to download in either epub, mobi (kindle), or pdf formats. Think Kill Bill meets Dune … Heroic Fantasy in world of ceramic weapons where all metal is magical! Haunted by terrible visions, and battling his own fear of Sorcery, the aging weaponmaster Belin must face the magical assassins that stalk the capital Raynor and bring the newborn son of the fallen Emperor — the last of the Cinanac line — to safety. The Jakirian series is Heroic Fantasy set on the world of Yos, with unique ecology and twin suns, where all metal is magical and control of magic is the basis for power. Hard-edged. Inspiring. The Jakirian features gritty, fast-paced action with strong themes of Heroic Fantasy. The setting includes fantastical magical artefacts such as glowmetals; ceramic weapons and an array of new creatures. The characters travel through both urban and rural landscapes, where a depth of history and a layering of cultures gives texture. Set thirty years before the events of The Calvanni, the action takes place on the night the Bulvuran Empire falls to the machinations of Hukum, the Sorcerer-Lord of cavern-dwelling Eathal, who has plotted a terrible Vengeance against the Cinanac Emperors. Only one aging warrior — Belin Kaidell — stands between the agents of Hukum and a final end to the rulers of Bulvuran. The Jakirian series comprises three books – The Calvanni, Scytheman and Sorcerer. They follow Cedrin and Ellen as they face deeper and more hidden threats. Pursuing them is Raziin, a vicious renegade who seeks to claim the ultimate power of the Spear of Carris for himself. Eventually they must face a final challenge as the most ancient secrets that bind their three bloodlines are revealed. The series has attracted readers of all kinds, including readers who, up until now, had never read books from the fantasy genre. Now, for the first time, readers can see where the story first started. 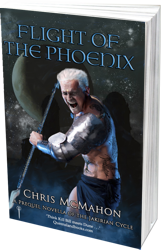 The Jakirian series has given McMahon the room to explore his unique world and to convey to readers the richness of his flavour of heroic Fantasy.